This dish is packed with different flavours, and is quick and simple to prepare. Put the cornflour, five-spice powder and some salt and pepper in an airtight plastic container with a lid and stir to combine. Add the sea bass, cover with the lid and shake gently to coat. Boil the kettle. Place the broccoli in a pan and pour over the not-quite boiling water. Leave for 20 minutes, then drain and set aside. Meanwhile, rinse the rice and place it in a large pot with a pinch of salt and pepper. Cook according to the packet instructions. To finish cooking the greens, heat the oil in a pan set over a medium-high heat. Fry the garlic, chilli and ginger for 30 seconds, until fragrant. Add the lime juice and let it bubble for a minute, then add the drained broccoli along with the soy sauce and oyster sauce. Add the bok choy and cook for a further 3 minutes. Add the vinegar and season to taste, then transfer the veg to a platter and keep warm. Wipe out the pan and put it back on the heat. Heat another bit of oil, then fry the floured sea bass pieces skin side down for 3 to 4 minutes, until it’s mostly cooked through and golden brown. Turn the fish over and switch off the heat. Add the sliced spring onion and let it sit in the pan with the fish for 3 minutes more. 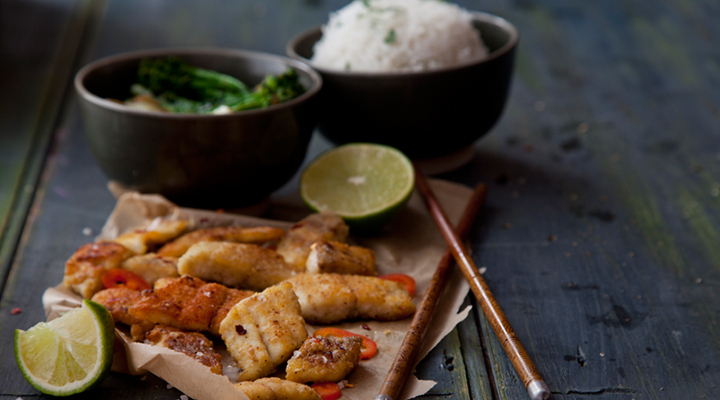 Place the crispy fish on a clean plate and drizzle with a little sesame oil and reduced salt soy sauce. Scoop the rice into a warmed serving bowl. Bring the rice, broccoli and fish to the table and allow everyone to help themselves.